USBscope50 is a new concept in USB DSO (Digital Storage Oscilloscope) products. PC based oscilloscopes deliver many user benefits including flexibility, ease of use and economy. The USB interface has developed into probably the best and most widely implemented PC peripheral connection method and is a natural choice for the DSO (Digital Storage Oscilloscope). USBscope50 combines very small form factor with high performance normally associated with much larger bench type products. Power for the DSO (Digital Storage Oscilloscope) is provided via the USB interface connector, further simplifying the user experience. Most USB DSO (Digital Storage Oscilloscopes) implement 2 channels but the USBscope50’s modular design allows the user to choose to configure a single channel or up to 4 channels . Elan’s proprietary synchronisation system ensures tight Oscilloscope channel to channel matching and concurrent triggering. 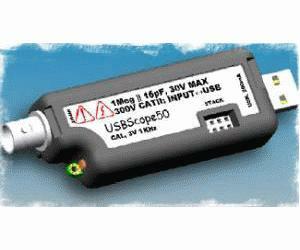 USBscope50 is small enough to be carried in a shirt pocket or laptop bag but uses standard BNC oscilloscope probes.